After receiving the same questions over and over again it finally dawned on us that we needed a Frequently Asked Questions page. We try to answer every question we receive via email, in our comments sections and on our Facebook and YouTube pages. To make it a little bit easier for you and for us as well, here are the most commonly asked questions. Q: I bought the Vermont American drill bits you recommended and have no idea what kind of drill these will fit? A: If you’re using a cordless drill, the front part of the drill unscrews to widen the ‘teeth’ so you can insert the bit. On a corded drill you will usually find a little tool on the cord to loosen/widen the front part. Make sure to tighten the front part of the drill to hold the drill bit securely before starting the drilling process. We made a video of Nick demonstrating how to insert the bit into the different types of drills. Q: Can you please explain to me how I can put a diamond like coating inside a bottle? Q: Could stuffing the lights into a bottle could cause them to short-out? A: I’ve had problems with strings of light myself. It worked out the same way your situation did. The lights worked fine until I had them in the bottle. Try this; plug the string of lights in and while they are lit, start inserting them. When I came to the trouble spot, the light string shut off. I had found the short but I still had a faulty string. I ended up scrapping the whole string and getting a new one. Q: Did you have to do anything to the label to preserve it from the heat of the light when its on? A: No, we usually don’t do anything with the label. Q: I was going to get a new dermal tool with a ¼ in. diamond drill bit is this going to work for making the hole? 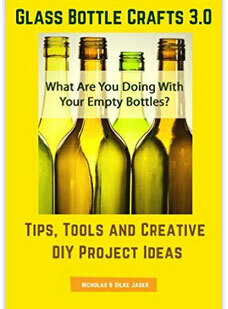 A: If your going to put lights in the bottle I would recommend getting a 1/2″ drill bit. It will accommodate the string of Christmas lights. If your just running the cord through the bottle for the lamp kit you’ll be fine with the 1/4″ drill bit. Q: Do you know if there’s transfer label that can be put on the lamp shade? A: I haven’t seen any labels for lamp shades before but that doesn’t mean they’re not available. Q: I don’t know where to get a small wax ring to contain water while drilling. Any suggestions?? Q: I had a couple of strings of 50 lights, but with connections on both ends. So, I drilled 3/4in hole in each bottle, folded the string in half and inserted into the bottle, that way the two connections were at the drilled hole and so I was able to connect one bottle to the other. It appears to be working. Do you think this is O.K.? A: I have strings of lights that have the connector plug at the end and I simply cut it (the connector) off. Plug it in again after you cut it off just to make sure it works. With the connector end off you can put the whole string in your bottle. I usually run about 35 lights in a regular sized wine bottle. What you’ve done is fine and if you like the final outcome then its all good. Q: How did you handle the finishing-off of the two wires, that are left? A: The cords to the ‘end connector’ are so small that I don’t even bother with them. I just leave them as they are. Little to none of the wire is actually exposed so it seems rather harmless. If you wanted to you could cap the ends off with some electrical tape or electrical caps. Q: I am having trouble keeping the labels intact. I live in the desert and they start peeling off by themselves with time. I have tried ‘modge podge’ sealant and this makes the bottles hazy – and does not keep the labels on! Clear spray lacquer does the same. Any suggestions? A: Buy a roll of clear 3” wide strapping (packing) tape, cut off two strips of tape to cover the entire label. You better try this with a throw away bottle first, I’m not sure how sophisticated this will look. Hopefully it will do the job of keeping your labels intact. Q: Where do you purchased the x-mas light strings, I can only find ones with male and female adapters. A: I have purchased Christmas lights with both the male and female ends before and still got them to work. Simply cut off the female end of the string of lights. The light string will still work fine and you’ll be able to feed them into the bottle. Q: What are the different size drill bits for your wine bottle lights? A: My go to drill bit is a 1/2 inch size bit. It depends on how big your lights are or if you only feed the wire for a lamp kit through the hole. Q: Are the lights dangerous inside the bottle?? A: Leaving the bottle lights on for an extended period of time will produce a certain amount of heat. If you do plan on leaving them on you may want to look into LED light strings. These lights use less electricity and give off no heat at all. Q: How do you splice the Christmas lights into the switch for the bottle kit? A: We have made a couple of videos that will help you with this process. 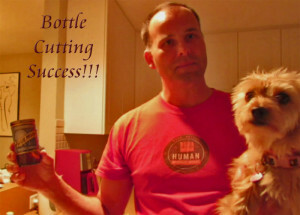 Q: Now I’m looking for different ideas of what to use inside my bottle??? Q: I am wondering if you ever considered filling a bottle with colored resin so it looks like it is full of liquor, etc. Wondering how to do this? A: That would be an interesting one to try. If you used the LED light strings you wouldn’t have to worry about the heat and it would have a better shelf life. I’m going to have to look into this more. I’ve never worked with resin before. Q: How do you wire a wine bottle with the led lights inside and then put a socket on top? Nick wrote an article on how to splice wire and attach a bottle lamp kit tutorial which includes a how to video. Q: When I cut the female end on a set of lights and tied the wires together, it popped the the small fuse inside the male end…Did I forget to do something else? A: I found out what I did wrong..I shouldn’t have joined the two snipped wires..Here’s a link explaining how to do it..
You shouldn’t have a problem running regular lights. We recommend a string of 35 lights. The bottle will get warm after awhile but nothing too dramatic. Q: I have tried this on 4 bottles. the first two didn’t go well. The bottom came off the first one. I think I drilled too fast. The second had two cracks near the hole. The third and 4 went a lot better, but it took me a couple of hours. Is this normal? A: You do have to be patient when drilling glass, but it shouldn’t take you more than 20 minutes or so. Q: I have tried to drill some wine bottles some were OK some not, the question is, the speed of the drill should be high or low? Q: Does the drilled hole have sharp edges? If so, how can we polish the edges so they are no longer sharp? A: The hole is usually not very sharp since it’s not a very big hole. You could always use a dremel tool or metal file to smooth out the edges if needed. Q: I can’t find anyone around my town with a large enough diamond drill bit, and if they have it…its on a drill press and they say they are unwilling to do the project. Menards largest bit is just over an inch. Is there a place to find a bit similar to the one you used, and how much does it cost? I’m guessing like 3 in diameter? A: We have reviewed our diamond drill bits on our Supplies and Resources page and have links to Amazon there. I just ordered a replacement 1/2 inch drill bit online for around $5.00. The bigger drill bits I own came in a Diamond Hole Set I received as a gift, the link to that one is on the above page as well. Q: Can you use a hand drill vs a drill press for the large bit? A: Yes, I used the 2 3/8 inch drill bit that comes with the set I mentioned earlier. You can use all the drill bits with either a drill press or handheld drill. Q: We have made several glass block night lights & used a Dremel drill so not sure if it would too fast on the thinner wine bottles since the glass blocks are much thicker. What is your thought on this? A: Your dremel should work just fine. Just remember to keep a steady amount of pressure. You could always practice on a ‘throw away’ bottle first. Q: Where did you attach the lamp and craft light together or are they on separate plugs? 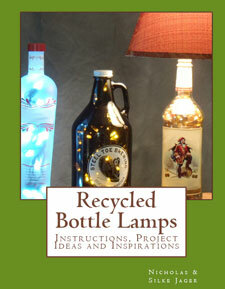 Q: I am going 2 attempt to made a lamp bottle this weekend, please could u tell me what size drill pit do i use. We also have a resources/supply page if you want to order the drill bits we use online. Q: I want to make a lamp with lights inside. I could use the typical wire nuts but that would look rather ungainly. Any suggestions will really be appreciated. A: I have used the smaller sized wire nuts as well as electrical tape and electrical shrink tubing. Q: I had two green glass bottles which kind of looked like Genie bottles but they broke while drilling. Not sure if it was me applying too much pressure, I didn’t think I did, or perhaps due to the curvature of the glass where I was drilling? A: Were they older bottles? Glass can be temperamental in that no two are alike. I had an instance where I had been drilling for quite some time and no kinks at all. Then everything came undone and I couldn’t figure out why. I hadn’t changed anything that I was doing, so why now? One new drill bit and I was back in the ball game. (I don’t know how long you’ve had yours, but it might be something to look at.) You seem to have had plenty of success. Once you get a feel of how they should drill it almost becomes natural. To summarize: 1) Different glass acts differently 2) Check your gear. Q: I want to add a picture to the bottle but don’t know how to apply it and make it last. I was thinking to glue it to the bottle the. Apply Mod Podge over it but didn’t know if it would ruin the picture. Also should I print the picture on Picture Paper or on plain white or even another type? A: I’ve used Modge Podge on a puzzle that I put together once and it worked fine. At first it looked kind of milky and I thought it messed up the whole thing. It dried over night and cleared through just fine. A reader’s suggested the following: Use thin mulberry paper and use Elmers glue with a small amount of water in it. Put glue on the bottle and then put the paper on it, then go over with more glue until all has glue on it. After it has dried, spray clear coat over it. Q: I can’t figure out how to get the “sparkles” to stick to the inside of a bottle. I want to “glue” the “sparkles” to the inside of a bottle, then add mini lights. Can you give me an idea on how to do this? A: Have you tried spray glue? It comes in an aerosol can and you can bend the extended nozzle around the inside of the bottle. Once you’ve done that you could put the sparkles in and move them around inside. Repeat the process until the inside is completely covered. Q: What lamp kits do you recommend for bottles with openings of 1 1/8th”? A: I use the three different sized stoppers that come with the lamp kit along with the other basic components. Even though I have three to choose from, on several occasions I’ve had to ‘doctor’ up the stopper to make it fit more snug. This was achieved by wrapping some tape around it so it would give it a little more dimension. In some of the pictures of bottle lamps, you’ll see that we put fabric or ribbon around the neck to cover this up and the end user won’t see it. Q: Where can I purchase the “snowflakes” that you put into the bottle. We would like to make some of our bottles with this filler. A: Did you mean the filler we put in the bottles or the bottle we put snow flakes on? We used acrylic filler and crystal fill for our bottle projects. The snow flakes were put on with the help of gel stickers and a can of glass frosting spray. Q: Could tell me what bit you used on your drill press? A: It depends on your lights. I always take the lights out and try to fit them in the different size bits. Once it looks like they will go through alright I will run with it. (1/2″ is the norm). We have a resources/supply page, on it you will find the drill bits I use (about half way down the page). Q: What RPM setting do you run (or what is the recommended RPM) your drill press on for drilling the holes in the wine bottles?? A: My drill press is only set up for on and off. If there’s a happy medium or medium speed I would go with that. Q: The wax ring you used in your video – is that something I can pick up at the local hardware store?? A: Yes. It’s called plumbers putty and if you keep it in a zip-loc bag when you’re not using it, it should last indefinitely. Q: Which tools work the best for the beginner? A: I would recommend the drill bits and the drill method for beginners. If you already have a drill all you will be out cost wise is the drill bits. If you find out that this is your ‘cup of tea’, then you might want to look into getting a bench drill press and the diamond hole set. Q: After much success making bottle lamps with a power cord hand drill, I decided to purchase a bench top Skil Drill Press. I just tried to drill holes and broke 3 bottles in a row. I am at a loss. I have adjusted the speed (RPM) of the drill press three different times and adjusted the pressure I was bringing the bit to the bottle to no avail. Can you recommend a speed I should be using for my Drill Press? A: My bench drill press didn’t have a speed setting. Only ON and OFF. I did start busting bottles out of the blue and I was confused as well. It finally dawned on me that my bit was dull. Sure enough, I could see that the edging where the raised edge had been was worn smooth. Once I replace my bit I was back in action. Q: How much do the drill bits cost? Q: Is there a plug, cork, or anything that can be used for the hole where the light wires move through?….thus to eliminate a chance of cutting yourself on glass? A: Good question. I’ve used rubber grommets before when I attached a switch to my bottle lights. These worked nice for not only hiding the edge of the drilled hole but also made the electrical cord more secure. You can find a link on our Supply page. Q: Would it not be easier to feed the lights in through the neck of the bottle? Remove power socket first, hook lead out of smaller hole at base, reconnect socket. Less drilling! A: I never thought about doing it that way but yes, you could. You wouldn’t have to actually make the hole so big. The opening at the top of the bottle would be large enough to accommodate the light string. This would work well if you planned on rewiring the lights to a switch or a longer cord. You could use a small weight on a string and then pull the wire through the bottle and out the hole in the back. A smaller hole in the bottle would be easier to hand drill. Q: I like how you use those fillers but wouldn’t they melt because of the heat coming off the lights?? A: The regular Christmas lights do get warm but this isn’t a concern. If you get the LED lights you won’t have any worries at all. Q: Where Can you get Crystal Filling? A: We have purchased Crystal Fill at our local craft store and online. 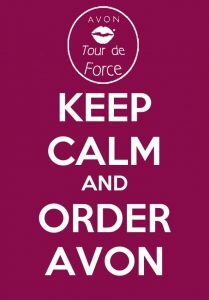 Visit our Supplies page for a link. Q: How long is the light set you use in a wine bottle? A: We use a regular sting of 35 lights. Q: Have you tried to use the spray frost on the bottles? Q: I tried this, but the bottle gets hot pretty fast. What gives? A: The drilling process or the lights in the bottle? The drilling process – try switching up the drill bits, going between the different sizes, it allows them to cool down. The lights in the bottle – Regular Christmas lights do get warm. If this is a problem then you can try LED lights which give off no heat at all. Q: I have tried a few times now to make one of these and I can’t get past the drilling of the hole. I have tried twice now and the bottle has broken both times. I have watched your video over and over and have done exactly as you stated…. What am I doing wrong? Does the drill brand and sizes matter? If so, what size of drill bits do you use and is one brand better than another? Please help? A: Are you using actual ‘glass drilling bits’? Check out the link on our Supply/Resources page. There is a picture of the drill bits that I use and you should be able to find out if you’re using the same. How far are you getting? Does the bottle break right away or are you well into the drilling process? I’ve used several different sized drill bits so the drilling process can be done in stages. Think of the first drill hole as the pilot hole. Working from there to expand on it. Q: Hi, will the Saber Tooth sanding kit work with the Bottle Bit? glass. Check out the Resources page to learn more about both tools. 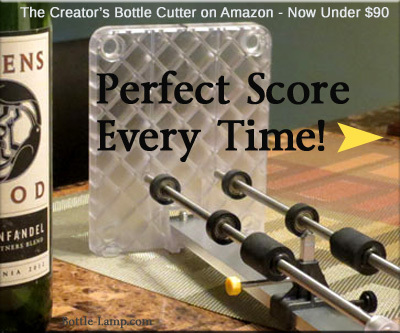 If you can’t find an answer to your own Bottle Light or Glass Crafting question, please visit our About Us page and use the email form to send us a message.